WTI crude prices have rallied back above $48.50/b this morning. 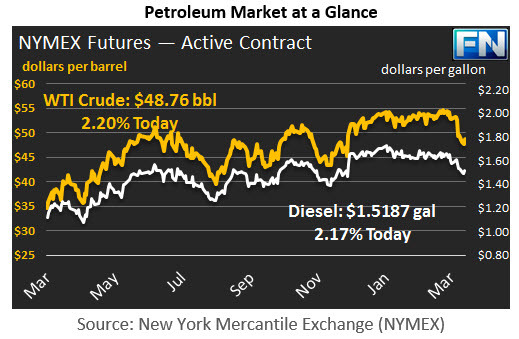 Yesterday, prices slumped well below $48/b, even threatening to crash below the $47/b floor. News of a surprise crude stock draw stopped the descent, and the market closed at $47.72/b. WTI opened at $48.76/b today, up $0.31 from yesterday’s opening. Current prices are $48.76/b, an increase of $1.04 above yesterday’s close. Diesel opened at $1.5118/gallon in today’s session. This was a recovery of 1.16 cents (0.77%) from yesterday’s opening price. Current prices are $1.5187/gallon, up 2.68 cents from yesterday’s close. Gasoline opened at $1.6029/gallon today, an increase of 2.27 cents, or 1.44%, from yesterday’s opening. Prices are $1.6085/gallon currently, up 2.5 cents from yesterday’s close. The latest data on crude production from OPEC continues to show high compliance rates. However, there is some disagreement on Saudi Arabia’s data for February: the Saudis reported that they reversed some of their production cuts, but OPEC reported the opposite. The main OPEC data series compiled from secondary sources shows Saudi Arabian crude production at 9797 kbpd in February, 68 kbpd below January’s production level. In contrast, Saudi Arabia reported to OPEC that it had increased its production to 10,011 kbpd, 214 kbpd more than the secondary sources reported. Prices fell, even though Saudi Arabia noted that the extra output was used to replenish its own storage tanks, not to export. Saudi output remains below the agreed-upon cap of 10,058 kbpd. In total, OPEC reported that its output declined from 32,099 kbpd in January to 31,959 kbpd in February, a drop of 140 kbpd. The possibility that the Saudis were backing away from aggressive cuts caused crude prices to continue downward. The descent halted when the API released its crude inventory data, reportedly showing a drawdown of 0.531 mmbbls. The market had anticipated a crude stock build of 3 to 4 mmbbls. API also noted a drawdown of 3.88 mmbbls of gasoline and 4.07 mmbbls of diesel. The market is awaiting the official EIA data on inventories, which has shown an unbroken string of weekly crude stock builds so far this year. The issue of brimming oil stockpiles has been one of the market’s chief bearish elements. Draining inventories to manageable levels is a key goal of the OPEC production cut pact, but OPEC recently acknowledged that the cuts had not yet had the desired impact. This afternoon, the Federal Reserve will announce its monetary policy decision. The market expects an interest rate increase of 0.25%. Anything higher would most likely strengthen the already-strong U.S. Dollar and put additional pressure on crude prices.